How can you use your sales pitches as a platform to inform and convince your customers? Printed catalogs are an outdated tool. The best option is an attractive and powerful product presentation as part of your e-commerce strategy. Imagine you want to present your product portfolio or a demo video to your customer. Would it not be great if it was just as easy in a one-on-one conversation as it is in an online store? Our specifically developed digital solution, it.product catalog, includes all the functions you are already familiar with from online shops – and even enables full offline access. Thanks to the mobile feature, your field sales representatives have everything they need for a perfect customer meeting, including technical information, images, prices, and videos. In no time at all, sales representatives can compare products, present suitable complementary items, and create favorites lists as well as shopping baskets. Without any paperwork, they are able to record successes directly as opportunities, quotes, or orders via the shopping basket in the backend system. All of this contributes to implementing an effective e-commerce strategy. Learn more about our quick, mobile and integrated digital sales solutions and offer your customers what they want – unique experiences. In modern business, it is vital for sales representatives to be able to provide prospective customers with all product information when needed – both online and offline. How Well-Equipped Are You for Sales? Does your sales tool support you optimally? Do you have access to all customer data at all times? Do you process opportunities and orders automatically? Is your mobile sales solution seamlessly integrated into your IT landscape? Does your sales team have all necessary technical resources to present your full range of products and services to the customer – in real-time and on site? If the answer to any of the above is “no”, you might like to take a look at it.product catalog. This mobile solution enables you to shape your sales pitches in a much more conclusive and successful way. Online stores shape our research and buying behavior. Your customers expect product presentations that quickly provide all important information at a glance and let them compare different products you offer. With it.product catalog, you have product-related images, graphics, texts, brochures, and videos on hand. This helps you show your customers all product benefits and bring the conversation to a successful closing. Before a meeting with your customer, you can review all important data related to ongoing contracts, purchasing history, and other relevant topics – online or offline. In addition, you are able to create customer-specific memos and favorites lists. In doing so, you ensure you are best prepared for your sales meeting. 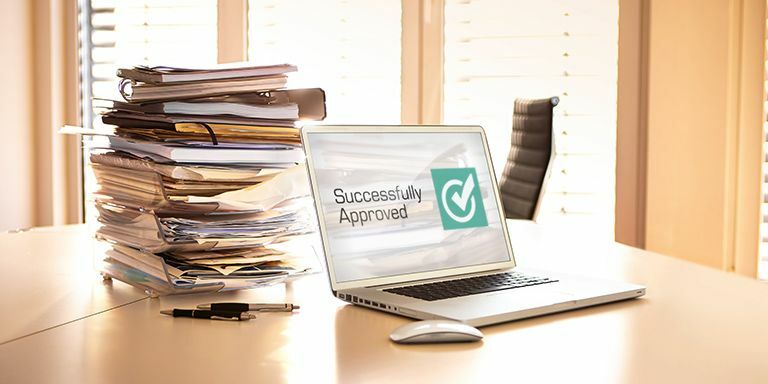 Sales success without paperwork: When the deal is done, you can initiate the order directly in the tool. You can also transmit opportunities and leads directly to your central sales office. Connect your ERP system, your CRM solution, or your online store directly to the it.product catalog. By doing so, you benefit from seamless information flow across all sales-relevant processes, gain more transparency, and reduce administrative burden. 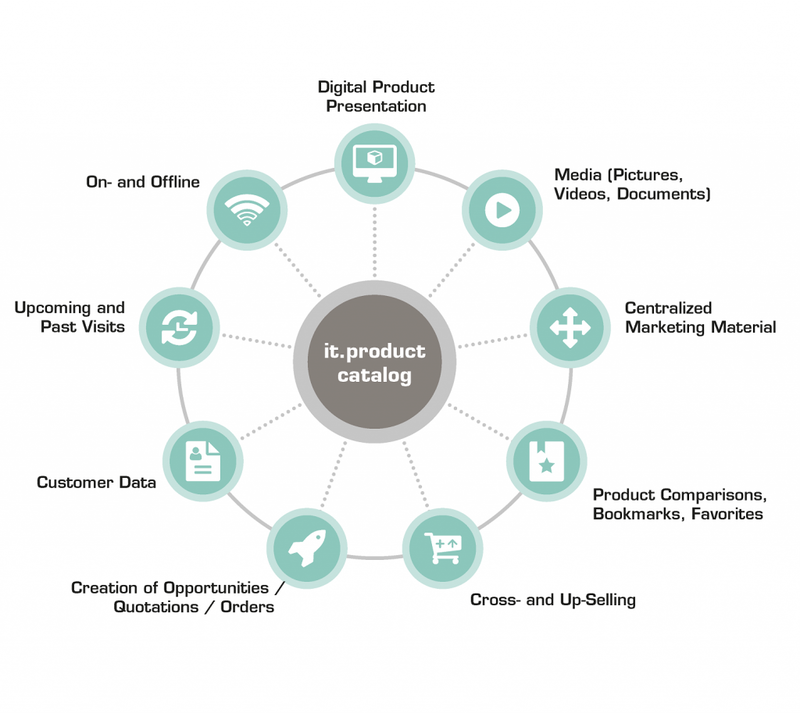 it.product catalog provides you with ideal support for your product presentation. Whether it is technical information, prices, supplementary brochures, or high-resolution images and videos – together with your customer, you can see all product information directly on a mobile device. In addition, you can position other products via up- and cross-selling – which makes for a convincing pitch. it.product catalog runs offline too. Even without internet access, you can hold a successful product presentation and submit product and customer data while on site. In both the preparation phase and follow-up stage, you have access to all product information and customer data within your reach – from master data to the latest offers and orders. In this way, you are always well-prepared for every sales pitch. Advanced online features complete the solution, allowing you to search for customers, carry out simulations in the backend, and record orders, opportunities, and quotes. Maintain and manage your master data about customers, contacts, and equipment from a single source via a user-friendly interface. You have access to real-time product information and customer data from your backend system at all times – from contact and order history, to sales order blocks as well as credit limits, and to outstanding invoices. With it.product catalog each sales representative can create customized memos or favorites lists which provide a comprehensive overview. In addition, quick access to product information, such as what the top products are, simplifies operations considerably. Is a customer already interested in one of your products? Then it goes straight into the shopping cart. In no time, an opportunity, quote, or order is created in the backend. It is just as easy as it is with Amazon and Co. In doing so, you improve the efficiency of subsequent processes significantly. 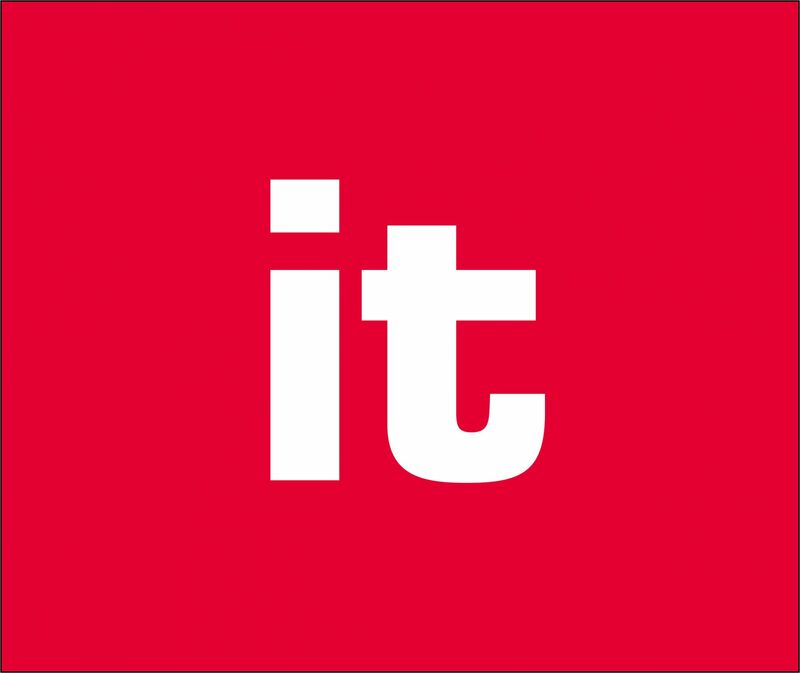 The it.product catalog can be connected to each backend system simply and quickly via web services. SAP ERP, SAP CRM and SAP C/4HANA Suite (formerly SAP Hybris Cloud) are already integrated by default. The backend acts as a data source for visits and customer data, as well as recording opportunities and quotes. Already operating an online store? Use the standardized catalog format and integrate all information directly into it.product catalog. Thanks to the integration of it.product catalog into your e-commerce strategy, you have identical data both within the solution and on the online store. Do you not have an e-commerce strategy yet? Not a problem: Even without an online store you can use it.product catalog to your benefit. For example, catalog generation can be performed out of the PIM or ERP systems. Thanks to the SAP C/4HANA Suite and the it.product catalog app, we were able to add significant value to our business within a short period of time. The solution enjoys a high level of acceptance among our sales representatives, primarily due to its ease of use. itelligence is one of the most successful international SAP consulting companies with more than 30 years of experience. We continuously develop our own solutions, working closely together with our clients. Several times a year, feature packs with new functions are released, which make the solution even more flexible. Want a demo of it.product catalog? To be precise: More than 6,000 worldwide. In addition to our certification as SAP Platinum Partner, we are an official SAP Hybris Regional Gold Partner, and have won numerous SAP Pinnacle awards – a clear reflection of quality, leadership in technology, and customer proximity. Our portfolio ranges from SAP consulting and licensing, to our own SAP industry solutions, all the way to application management services and hosting. As a member of the NTT DATA group, we have leading-edge resources available to support you and provide thought leadership. With data centers located throughout the world, we deliver support wherever you need it. Can you provide customers with every detail they need, at any time and anywhere? Better go digital – with our it.product catalog AddOn. Would you like to receive more information about it.product catalog? Do you want more detailed advice from our experts or would you like to book an it.product catalog workshop?